Lucas Films has released a total of seven films in the series of Star Wars movies. Many toys and other types of merchandise has been produced based on these films. Some of the more popular toys released so far are the LEGO Star Wars sets. The LEGO Group has created sets based on the most popular scenes from each of the films. We will dive into each of these films LEGO systems here. The Phantom Menace was released in 1999, many years after the original movies were released. The LEGO Group has released quite a few sets based on this movie which include the Mos Espa Podrace, the now famous scene from the Phantom Menace. The Mos Espa Podrace includes quite a few Star Wars LEGO mini figures which is even more reason why this set is prized by collectors. Attack of the Clones, not to be confused with the Clone Wars, was the second film released as a follow up to the original Star Wars series. The Attack of the Clones LEGO Sets include some of the more desirable Star Wars LEGO mini figures, like the Tusken Raiders, which are unique to this series, Count Dooku, Yoda, and the ever popular and hard to find Jango Fett. The Revenge of the Sith was the third movie released after the original movies. Episode III was released in 2005. The Revenge of the Sith series of LEGO sets includes one of the more imaginative LEGO sets in the Darth Vader Transformation. 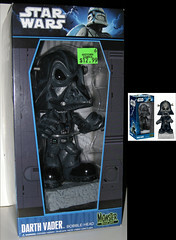 This set includes an Anakin Walker mini figure and a Darth Vader mini figure and depicts Anakin’s transformation to Darth Vader. A New Hope is actually the first film released by LucasFilms in it’s now legendary Star Wars series. Now called Episode IV, a New Hope was released in 1977. More than twenty years later, LucasFilms and the LEGO Group teamed up to recreate the Star Wars series in LEGO sets. These systems are now the LEGO Group’s best selling building block toys. The Empire Strikes Back was the second film released of the original movies. This film was originally released in 1980. Episode V LEGO sets include some highly prized Star Wars LEGO mini figures including Boba Fett, a Han Solo in carbonite, and Emperor Palpatine. A great LEGO set to own from this series of LEGO sets is the Cloud City 10123. The Return of the Jedi is the final installment in the original series of movies. Return of the Jedi sets include some really cool Star Wars LEGO Mini figures like the mini figures from the Jabba the Hutt series of sets, Jabba the Hutt himself, a disguised Lando, and a half naked Princess Leia. The Clone Wars movie is based on the like named animated series of a few years back. The sets produced around this movie are different from other LEGO Sets in that LEGO went for an animated look with the mini figures that are included with these sets. Pedro collects Star Wars LEGO Systems and is always on the lookout for rare LEGO Star Wars mini figures.